Rainforest conservation – Challenges of addressing deforestation issues: | PARTHA DAS SHARMA's Weblog on "Keeping World Environment Safer and Greener"
The rainforest biome (a major habitat type) can be defined as forest growing in regions with more than 200 cm (6.5 feet) of rainfall per year. 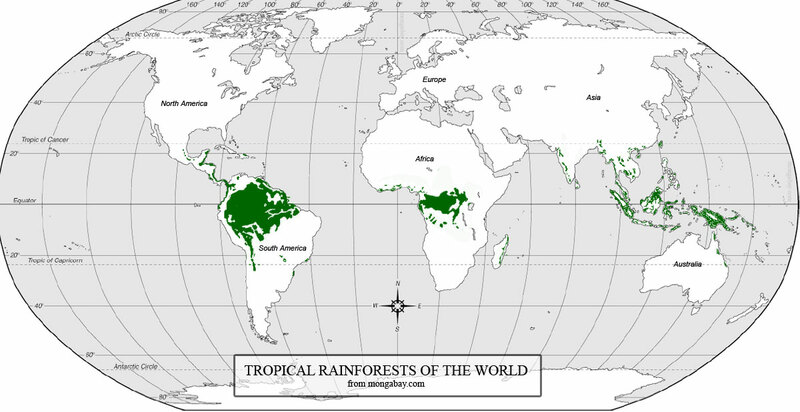 Although there are temperate rainforests (such as that of British Columbia in Canada), tropical rainforests occur between the Tropic of Cancer and the Tropic of Capricorn (23.5o N and 23.5o S). They are found in regions where the average temperatures of the three warmest and the three coldest months do not differ by more than 5o C, although there may be daily variations of more than that. Rainfall is relatively evenly distributed, which allows the growth of a heavy canopy of broad-leaved evergreen tree. The rainforests are home to more than half the animals in the world. Rainforest animals reside in all four strata of the forest. ‘Strata’ means ‘layers’. 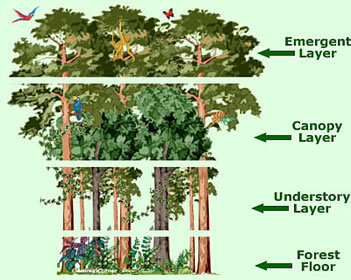 Scientists divide rainforests into different strata (or layers) for easy reference. Each of these layers is a very different environment and supports different life forms. The strata differ in many ways, including temperature, the amount of sunlight that they receive, the wetness of the environment and the amount and types of life forms living in it. Today tropical rainforests are disappearing from the face of the globe more rapidly than anything else. As per the estimation, despite growing international concern, rainforests continue to be destroyed at a pace exceeding 80,000 acres (32,000 hectares) per day. World rainforest cover now stands at around 2.5 million square miles (6 million square kilometers), representing around 5 percent of the world’s land surface. Unfortunately, much of this remaining area has been impacted by human activities and no longer retains its full original biodiversity. Deforestation of tropical rainforests has a global impact through species extinction, the loss of important ecosystem services and renewable resources, and the reduction of carbon sinks. The problem must be remedied, but the means are not as simple as fortifying fences around the remaining rainforests or banning the timber trade. Economic, political, and social pressures are not allowing rainforests to persist. Forces behind rainforest loss – Countries with significant rainforest cover are generally among the world’s poorest. Therefore, rainforests are being cut mostly for economic reasons, though there are political and social motivations as well. A significant portion of deforestation is caused by poor farmers simply trying to eke out a living on marginal lands. Beyond conversion for subsistence agriculture, activities like logging, clearing for cattle pasture and commercial agriculture are sizeable contributors to deforestation on a global scale. Agricultural fires typically used for land-clearing are increasingly spreading outside cultivated areas and into degraded rainforest regions. Addressing deforestation issues– Addressing deforestation is a quite tougher job. Different needs and interests of various groups of people have to be taken into consideration while addressing the deforestation matter. a. Rural farmers – Poor farmers are simply trying to put food on the table for their families. A better approach to addressing the needs of the rural poor may be improving and intensifying currently existing agricultural projects and promoting alternative cultivation techniques. b. Industrial/commercial developers – At present, illegal logging and counterfeit labeling are major obstacles facing sustainable forest management for timber, but in time the development of higher yielding timber plantations will help alleviate pressures on natural forests. Increased raw material need of the emerging economies is again main reason of large scale deforestation, which need to be curtailed by promoting culture of recycling almost every product we use and by conservation. c. Restoring and rehabilitating ecosystems – There is no use bemoaning past deforestation of large areas. Today the concern is how to best utilize lands already cleared so that, they support productive activities, now and for future generations. Without improving the well-being of people living in and around forests, we cannot expect rainforests to persist as fully functional systems and continue to cater to our needs. To lessen future forest loss, we must increase and sustain the productivity of farms, pastures, plantations, and scrub land in addition to restoring species and ecosystems to degraded habitats. By reducing wasteful land-use practices, consolidating gains on existing cleared lands, and improving already developed lands, we can diminish the need to clear additional forest. (i) Ecotourism—Ecotourism can fund efforts both through park entrance fees and employing locals as guides and in the handicraft and service sectors etc. (ii) Bio-prospecting fees—Rainforest countries can earn revenue by allowing scientists to develop products from the country’s native plant (e.g., with potential pharmaceutical applications etc.) and animal species. The royalties obtained from such commercial agreement should be set aside for conservation projects developed through local communities. (iii) Carbon credits – For setting aside forest for the purpose of atmospheric carbon mitigation, developing countries can receive payments from industrialized countries looking to offset their carbon emissions. (iv) Corporate sponsorship – Corporations have the money and a marketing-driven interest in taking a closer look at sponsorship issue. (i) Expand protected areas—As many areas should be protected as soon as possible. If protected areas can be developed in such a manner to generate income for local communities, an increasing number of parks should theoretically create more economic benefits for a greater share of the population. (ii) Increase surveillance of and patrols in protected areas—This can be done at a reduced cost if local communities benefit from the success of the park. If locals have a vested interest, i.e. are compensated via entrance fees etc. ; they will want to watch the park so that the source of their income is not diminished. Community surveillance is the most effective way to patrol a protected area, though it will probably be necessary to have park staff conduct patrols as well. Guides should be trained as well to keep watch for activities that are damaging to the ecosystem and report suspicious activities at park headquarters. (iii) Build research facilities for training local scientists and guides. (iv) Establish programs that promote sustainable use. (vii) Ensure economic success does not result in increased deforestation. (viii) Encourage entrepreneurship – Encouraging entrepreneurship through such a micro-credit strategy could pay significant dividends for a country’s economy as a whole. Conclusion – Simply banning the timber trade or establishing reserves will not be enough to salvage the world’s remaining tropical rainforests. In order for the forest to be preserved, the underlying social, economic, and political reasons for deforestation must be recognized and addressed.